Hi! My name is Marie-France Roy and I am an inveterate traveller. In fact you could say I’m obsessed with travel. I would not be happy with the “trip of a lifetime”; I want a lifetime of trips! And since I don’t have a big savings account, or any rich relatives, this means I have to budget. And I’ve become pretty good at it over the years. So far I have visited 59 countries and every continent (see also map), and I’m hoping to visit at least 100 in my lifetime. But how did I become such a big travel nut? Even though I had been dreaming of travelling ever since I was a young girl, I was 29 by the time I went on my first real adventure: three weeks in Europe. On my own. After that first trip to Europe, I was hooked. I quickly learned to travel lighter, cheaper and more confidently. I sought out opportunities to travel on my own (which quickly became my preferred way of travelling) as I ventured further and further from home, and embarked on more daring adventures on every continent. Gradually, travelling became a priority and the “career” was placed on the back-burner, becoming simply a way to sustain my new addiction. I knew that this was not just “something to get out of my system”. It was here to stay, and I would have to eventually build my lifestyle around it. In the spring of 2013, I decided to dedicate myself full-time to building my travel website. 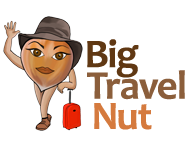 On August 21, 2013, BigTravelNut was born! Travel writing is not a new dream. I toyed with it for almost 20 years before taking the plunge. Now I enjoy sharing my tips and experiences with a much larger audience of like-minded travellers, those who would like to explore more of our wonderful planet and learn not only how to save money, but how to build more interesting trips! If you want to travel solo, stray from the crowds, and discover off-the-beaten-path destinations with small price tags, you’ve come to the right place. For more information about me professionally, see my LinkedIn profile and my writing portfolio (outside of the blog). Also read About this site to learn more about the motivation behind the site, what to expect, and why BigTravelNut is different!